Thailand is one of the coolest places to be without having something as amazing as this off the cost of Yao Noi. 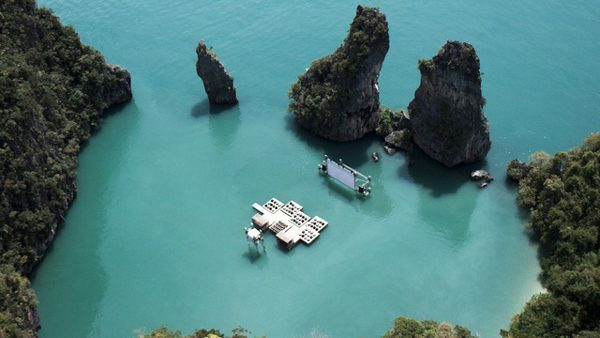 The outdoor cinema constructed in the middle of an archipelago sheltered by stunning rock formations has been built for a dedicated film festival which screens films during evenings. Using recycled wood and other materials, a giant modular raft was constructed to hold the audience. Viewers relax on large cushions and enjoy the sounds of the ocean as well as the film on the screen in front of them. 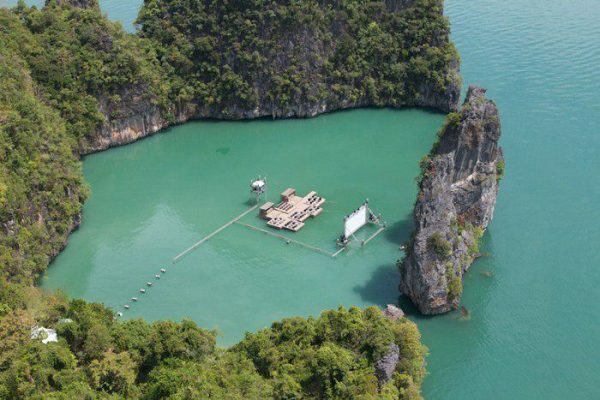 The rafts are loosely held together as well as anchored to the bottom of the lagoon, allowing for the ocean to push and prod the structure while keeping it within a reasonable viewing angle of the screen. The massive display and projector are secured more firmly to the bottom of the bay, which is probably a good idea considering that these structures house all the important electrical components and wouldn’t take kindly to a dip in the ocean. The viewing raft is designed to be portable, and will likely be used for other events in the future as well.